Tell your LCS you want to get your grubby hands on my variant cover with the codeDEC151491 (or DEC151490 for the main cover). Cut off date for pre-orders is Feb, 29th. "PANTS! is a legendary “LOST EPISODE” of Invader ZIM. A story that finds Dib battling an invasion of disgusting alien pants with mind-control powers, it was originally shot-down for reasons that are now lost in the mists of time. But writer Eric Trueheart never gave up carrying the torch for the trousers. 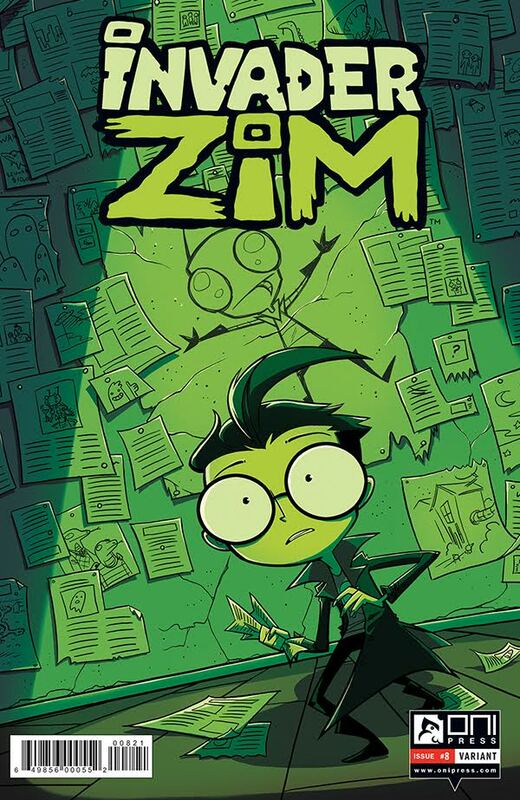 Now Trueheart, series-creator Jhonen Vasquez, and artists Aaron Alexovich and Dave Crosland finally bring the pants out of the closet and onto the page. A tale as funny as it is creepy, PANTS! will delight old-school ZIM fans and newcomers alike, and make you never look at your legs the same way again." ....and without the logos for good measure. Thanks Oni Press!